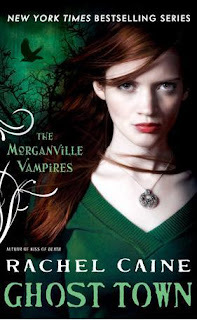 Description (From Goodreads): While developing a new system to maintain Morganville's defenses, student Claire Danvers discovers a way to amplify vampire mental powers. Through this, she's able to re-establish the field around this vampire-infested Texas college town that protects it from outsiders. Let me just begin by saying that I am a huge fan of this series and If you haven't started reading it, do so right now. I read the complete thing (books 1-9) in less than a week. It was that addicting. Anyways, like the other books, Ghost Town was beautifully written and included all of the elements that I love about this series. 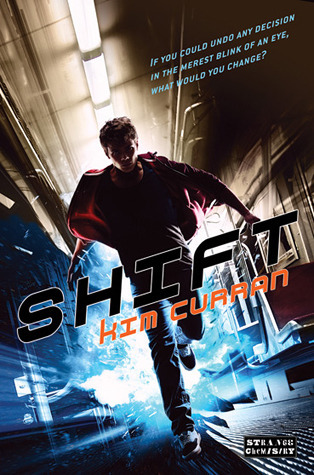 There is tons of mystery, excitement, romance and humor.I have to admit, I was a bit skeptical going into book 9, I mean usually by this point, a series starts to go off the deep end. Honestly, how far can you take the same set of characters? And how exactly do you follow up a villian like Bishop? But somehow Caine managed to keep things going strong, by pulling out all the stops. Tell me what is more frightening than having everyone you know and love forget you? Claire is as feisty and determined as ever. She, once again, gets herself in an undesirable predicament. As a punishment, she is forced to fix the machine that wipes the memories of those who leave Morganville. Well, of course, something goes wrong and people (and vampires) start loosing their memories. Those who are infected are taken back mentally to three years ago. Let's just say that chaos ensues. Soon, Claire has no choice but to try and fix the machine and she is forced to make some unlikely alliances along the way. There is plenty of excitement within the book, just like you would come to expect from this series. There are also a number of twists throughout the plot, I don't want to give too much away, but they certainly keep you on your toes. All of your favorite characters are back and ready for action, Eve, Michael, Shane, Mrynin, Amelie and Oliver are all featured throughout the book. I think what makes this series so great is the relationships between the characters. Not only are there great romantic relationships, but there are also a number of awesome friendships. I love the fab four - Claire, Shane, Eve and Michael; I just think they mesh well together. They always have each others back and each one of them would put themselves on the line for the other three. The connection these characters have is really a focus in this book - especially when people start loosing their memories. Caine really does a beautiful job showing how they all sort of gravitate towards each other. All in all, Ghost Town was a great addition to the series. Everything that you love about this series continues in book 9, including the sarcasm, humor, excitement, danger, romance and superb storytelling. I'll say it again, if you haven't read this series yet, you really, really, need to. It is never to late to dive into a series, in fact I prefer it because you don't have to wait as long to see what happens next! I love this series but haven't read Ghost Town yet. I refuse to buy it in hardback when the rest of mine are in paperback. Maybe I'll get an ecopy of it first. Great review!